George Pasquarello, D.O., F.A.A.O., C.A.Q.P.M. Dr. Pasquarello received his Doctor of Osteopathy (DO) from the University of New England College of Osteopathic Medicine in Biddeford, Maine. He completed a rotating internship at Kennedy Memorial Hospitals in New Jersey and a residency in Osteopathic Manipulative Medicine at University of New England College of Osteopathic Medicine in Maine. He is Board Certified in Neuromusculoskeletal Medicine and Osteopathic Manipulative Medicine, holds a Certificate of Added Qualification in Pain Medicine (CAQPM) and a Certificate of Competency in Osteopathy in the Cranial Field. He was awarded Fellowship in the American Academy of Osteopathy (FAAO) in 2002. 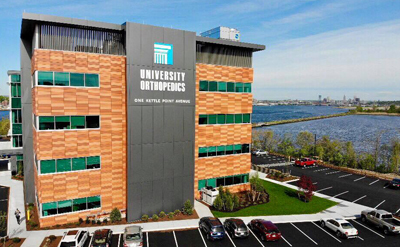 Prior to joining University Orthopedics, Dr. Pasquarello practiced Neuromusculoskeletal and Osteopathic Manipulative Medicine at East Greenwich Spine & Sport since 2004. He previously worked as a clinical specialist at Maine Spine and Rehabilitation while also teaching at the University of New England College of Osteopathic Medicine from 1996-2005. Dr. Pasquarello lectures at the state, national and international level to physicians and students on Osteopathic Manipulative Medicine, Myofascial Pain, Prolotherapy, Platelet Rich Plasma Injection and Musculoskeletal Ultrasound. He has been an invited speaker at prestigious programs including Harvard University Medical School Continuing Medical Education programs: Introduction to Osteopathic Manipulative Treatment and Evaluating and Treating Pain: Principles and Practices of Pain Medicine 2016. He has lectured abroad including Canada, France, Italy and Turkey. He has several publications on Osteopathic Manipulative Treatment, Prolotherapy and conservative management of acute and chronic pain conditions. Publications include co-authoring the chapter Osteopathic Manipulative Treatment in the American College of Orthopedic Surgeons’ Orthopedic Knowledge Update 4th edition. He is also the co-author the comprehensive textbook Principles of Prolotherapy. Dr. Pasquarello Profile from JH Communications on Vimeo. He will do whatever he can to help relieve my pain. I really appreciate him personally administering injections in his office to try and get me relief. He always says that I am here to help you and just call and let me know how I can help. Dr Pasquarello has a wonderful way of communicating with his patients. He makes you feel very comfortable and eases your fears of any procedure. He is a wonderful doctor and very empathetic and kind human being. Dr P’s PA did all the interactive part of the exam. He came in already informed and ready to do the work. Which was wonderful. But I had very little interaction with him on a personal level. Was very pleased with my visit. Dr explained everything very thoroughly. I left feeling very grateful to Dr. Pasquerello for his kindness and expertise. I will returning soon for the injection that he recommended. Dr. Pasquarello is very informative and makes me feel very comfortable. Also answers questions in explantions that I understand. I have worked with Dr George Pasquarello in the past. He is a very compassionate and knowledgeable doctor. With incredible skills. I’m glad to be able to come and see him again. My insurance and out of pocket costs were the determining reasons I haven’t seen him for several years. He recommended me to a different specialist that might better help me. This man has an incredible ability to make people well. I heard about him from a friend who experienced unrelenting pain and found his skills to be beyond my expectations. I recommend him to everyone I know who need help with their back. Very informative. Explained everything he was doing as he did it. Listened well and made recommendations after a thorough exam. my first message 2 business days ago. I’ve had great anxiety worrying about my medical issue. I found the office atmosphere as well as Dr Pasquarello’s professionalism an approach to be calming and reassuring. I was very impressed with the care I received. Wish he had been able to review MRI results prior to appointment. If additional testing becomes necessary, I will ensure that the office is aware of the testing and that the test results are transmitted prior to an appointment.